Summary of events below (click on table for clearer version). Detailed information on each event follows on below. Information on our Open Water TRAINING sessions is provided [here]. To register your swimmer/s interest for any of these events please either update the spreadsheet here: [LINK], OR email karen@crabtree.com stating: name of swimmer, year of birth, squad, events interested in and any 800 / 1500m time (if they have one). Venue: Surrey Docks Water Sports Centre, Rope St, Rotherhithe London SE16 7SX. The Kent Championships is held in conjunction with London Region OW Championships. There are no qualifying times for this event – anyone with an ASA number can enter (incl Masters swimmers). 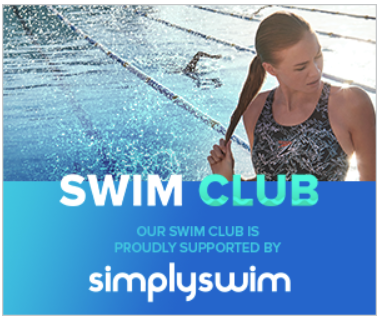 However, we require all potential competitors to have either attended a TSC open water training session or have previously competed in an open water race. This race is anticipated to be a ‘non-wetsuit’ race based on previous years’ water temperatures, however there is a risk of the race becoming ‘wetsuit optional’ (read event conditions closely). This event has been oversubscribed for the last few years and often many entries are rejected – Entries are being accepted on a first-come-first-served basis with only a few spaces reserved for Kent ‘Rural’ Clubs (because of this we want to collate and submit our entries straight after our first training session, i.e. by Mon 3rd June). If you want to attend this event, please email karen@crabtree.com quoting each swimmer’s full name, ASA number, date of birth, and a parental contact phone number. Payments to be made via the club’s gala booking web-page in Early May. No entries will be accepted after 8pm on Monday 3rd June. There are no qualifying times for this event – anyone with an ASA number can enter (incl Masters swimmers). 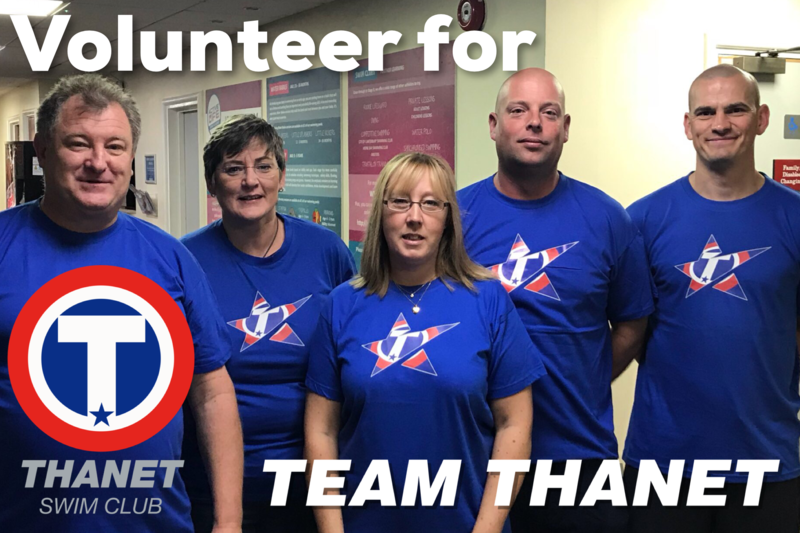 However, we require all potential competitors to have either attended a TSC open water training session or have previously competed in open water race. There is a risk that this event may become oversubscribed this year. Because of this we will need to submit our entries as soon as possible after the event is announced. If you plan on attending this event, please confirm via email to karen@crabtree.com so she can keep you informed and coordinate our team and team manager provision. Entries to be made on a individual basis direct to SE Region, Karen Crabtree will provide the required ‘authorised club signature’ on the entry paperwork – it cannot be submitted without this. Karen will be on the Hartsdown balcony on Thursdays from 5:30pm until 7pm. Entries close 29th June – but we recommend placing your entries early June. National OW entry via achieving the 1500/800m pool QT or by achieving a top 3 place at the SE Region OW Championships. 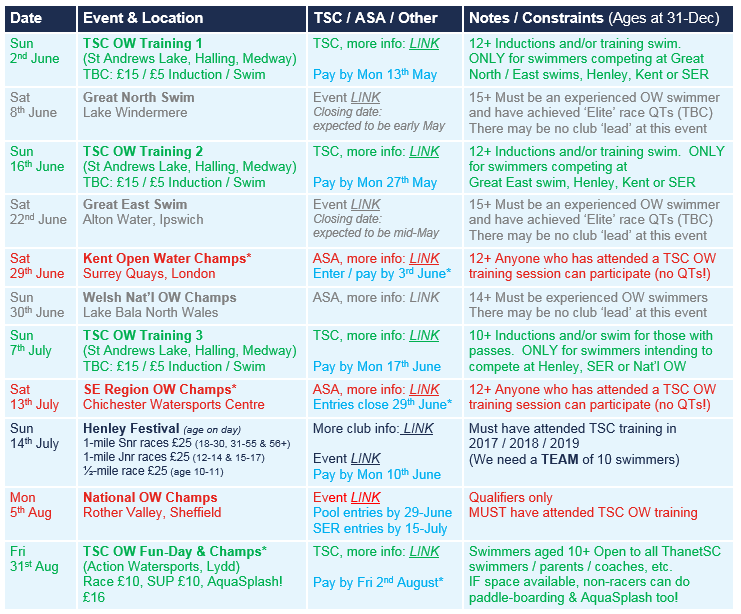 Events that our experienced open water swimmers are considering entering / have already entered are listed below. If anyone else would like to join us at any of these events, please register your interest [here] or by e-mailing Karen Crabtree. For very experienced OW swimmers only the GNS is the qualifying ‘Trials’ event for the European Junior Open Water Championships. This is the day after the Kent OW Champs in London. A very tough race – only for experienced OW Swimmers. Please contact Karen Crabtree. if you want any further information regarding this race.